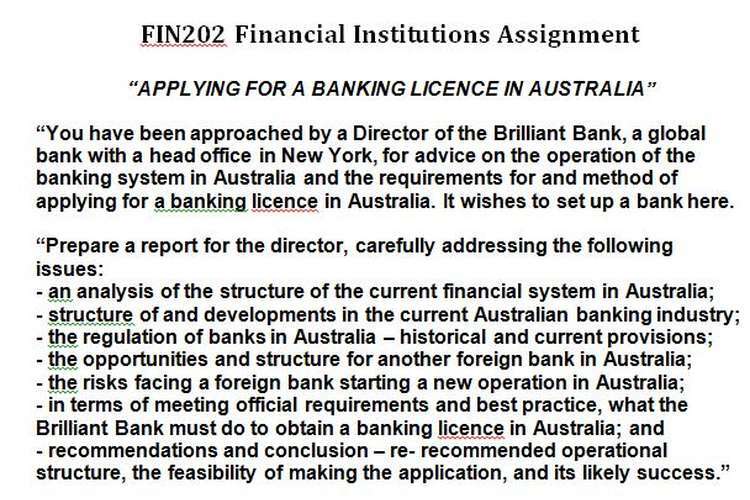 In FIN202 Financial Institutions Assignment you have been approached by a Director of the Brilliant Bank, a global bank with a head office in New York, for advice on the operation of the banking system in Australia and the requirements for and method of applying for a banking licence in Australia. It wishes to set up a bank here.? recommendations and conclusion recommended operational structure, the feasibility of making the application, and its likely success. Further details on the presentation and lodgment requirements for the Assignment and penalties for late lodgment, along with the rubric for assessment purposes, are set out in the Subject Outline (SO), pages 7- 8.? Length – 2,500 words + / - 10%. You should begin by reading the references relating to the topic and subject content in the text-book. It is suggested that you search these references via the Index at the back of the text. You will need to discover at least 6 other references. This should include at least one other book and one journal article. Search the web-sites suggested in the text and the SO. See Subject Outline, pages 7 – 8. The purpose of this Assignment is to test your initiative as advanced degree students, and to test your ability to discover, apply and interpret financial management.